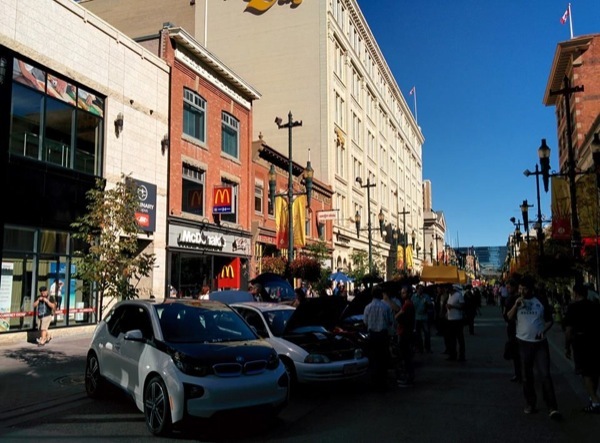 Thousands of Calgarians witnessed 24 electric vehicles taking over almost an entire block in the heart of downtown Calgary. Combined the electric vehicles on display had a combined mileage of nearly 320,000 km (200,000 miles)! It was a beautiful and sunny day which was a relief given unprecedented snowfall pounding the city in early September. Many enthusiastic members of the public saw electric vehicles for the first time and learned more about the advantages of "Driving Electric" from knowledgeable owners. This was the inaugural public event of the recently founded Electric Vehicle Association of Alberta (EVAA) and the largest gathering of electric vehicles in Alberta ever. We are excited to make NDEW 2015 bigger and better with a larger venue that can accommodate test rides for all to experience electric first hand! EVAA is proud to be hosting a National Drive Electric Week event in the heart of downtown Calgary featuring local electric vehicle (EV) owners and their vehicles! The event will be taking place along Stephen Avenue/8 Ave SW in front of the Bay Downtown between 10 AM and 4 PM. There will be a variety of vehicles on display such as the Chevy Volt, Nissan Leaf, Tesla Model S, Zero Electric motorcycle, Team Zeus electric motorcycle, and even an 1986 Porsche 944 conversion. What are Electric Vehicles (EVs)? EVs are a type of vehicle in which the primary "fuel source" is electric and the owner plugs in their car to charge it. There are two main types of EVs: plug-in hybrids (PHEVs) and battery electric vehicles (BEV). A PHEV usually has a smaller battery capable of doing city driving with 18-60 km of range which when exhausted switches to a gasoline engine to provide extended range. A BEV is 100% electric and because it has a larger battery it does not run on fossil fuels whatsoever and can achieve a longer driving range of approximately 100-500 km depending on the model. EVs have many useful advantages over fossil fuel burners including a smooth, quiet, and fun ride thanks to the lower center of gravity. Electric motors deliver 100% torque off the line for incredibly responsive and thrilling acceleration! EVs are virtually maintenance free and can be "fueled" with electricity which is about 1/8 the cost gasoline resulting in savings of $2000 or more per year which quickly recoups the initial higher cost and results in lower total cost of ownership past the 5 year mark. Charging up is convenient as plugging in at night without having to detour to a gas station and wait in line, while being at the mercy of constantly rising gasoline prices. Above all, because of their efficiency and zero emissions, electric vehicles move us towards a sustainable society on a parallel track with renewable energy development! There are currently 36 attendees registered. Registered attendees report 137,500 electric miles driven.